Napa city leaders are hoping swarms of tourists will flock to wine country for the holiday Labor Day weekend – and spend money that was lost this week after Sunday’s earthquake. Workers at Saintsbury’s Winery - which suffered many broken bottles - spent Friday morning picking up grapes and allowed the public to be part of the process. The winery's co-founder, David Graves, said reservations this weekend are solid. "We have had a few cancellations, but I think people realize Napa is open for business," he said. While some of Napa is open for business, several blocks of the downtown area remain fenced off. In addition, several restaurants and shops on Main Street remain closed. City officials on Friday said more than 1,000 structures have been tagged unsafe due to damage sustained from the 6.0-magnitude earthquake. It has been a frustrating week for the owner of Velo Pizzeria -- building inspectors closed the restaurant on Thursday. Owner Lewis Chilton said he started the business nearly three weeks ago. "For the last year we've been investing money in this business," Chilton said. "Our landlord has been investing money in this business." Chilton is hopeful the restaurant will reopen soon so that he can start earning some of the money he has invested in opening the business back. 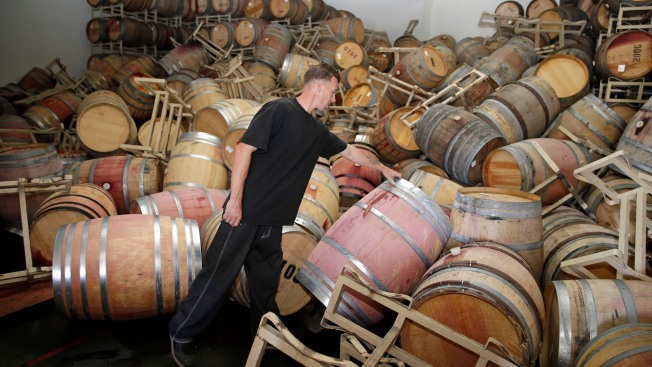 "It's a big weekend, a kick-off of the harvest of Napa Valley," he said. And it's important for our employees. It's a big weekend for them to make money too." The city is hoping all the attention from the quake will help entice the tourists back. Meanwhile, businesses depending on locals are suffering. A local deli said business is down 30 percent since the temblor hit and a hair salon reports a 70 percent drop this week.